BOOST PLUS® drink with 360 Calories per serving has 1.5 times the Calories of BOOST® Original Drink, and provides 14 grams high-quality protein. Increased calorie intake may help to gain and maintain a healthy weight. Also provides 3 grams of fiber to support digestive health, and 26 essential vitamins & minerals, including calcium and vitamin D to support bone health. 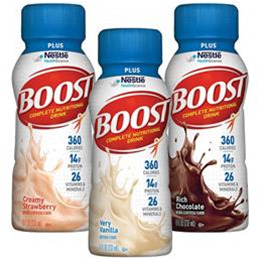 Have BOOST PLUS® drink as a nutritious snack or with a meal to help meet daily nutritional needs.